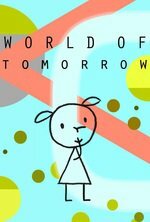 Don Hertzfeldt's latest short, World of Tomorrow, follows 3-year old Emily Prime as she visits the future, invited by a third-generation version of herself, and learns about the fate of humanity. A.V.Club has somewhat spoilerish review here: A cartoon about a clone from the future may be 2015’s best film. I recommend watching before reading, but cannot help quoting this part: "For me, the brevity of “World Of Tomorrow” isn’t a stumbling block, it’s a virtue. How often is a movie this outstanding also so concise that it can be watched at least once a day?" I haven't checked myself yet, but word on the street is that it's up on Netflix streaming as well. Yes it is on Netflix streaming. Looks like they added several short films yesterday or the day before -- all award winners maybe? I have no idea. I just watched this because of this post and, yeah, it's pretty great. And very dense -- there's a lot to think about in those sixteen minutes. Well, I have something else to wholeheartedly root for at the Academy Awards now. This was so, so good. Well, and I just now watched It's Such a Beautiful Day (also available on Netflix) and ... wow. Oh, my. Ah yes, this is wonderful. One thing that the movie does perfectly is to make you feel sad and delighted all at the same time. For example over the robots who are programmed to fear the dark and keep eternally moving on the bright side of the moon (and their poetry!). Or over all the beautiful dead bodies falling in flames from the sky. Or when Emily confesses that she's incapable of dealing with the loss of her love but that sometimes, at nights, she sits in the dark and feels very bad. In short, there's no such thing here as an opposition between joy and sadness. They always come together. When "It's Such a Beautiful Day" didn't even get nominated was when I stopped caring about the Academy Awards (the first chapter is on YouTube, btw, for those of us who don't have Netflix). But "World of Tomorrow" is an easier rewatch for me. When the full impact of "It's Such a Beautiful Day" hits me, I have to just sit down and do nothing for a bit (heck, just thinking about it makes me want to sit down and do nothing for a bit). Tomorrow I can watch every day. Wow. That was .... wow. Who knew that fifteen minutes of stick figure animation could more satisfying and emotionally resonant than most two hour films? Compare/contrast: Hertzfeldt's Simpsons Couch Gag, 2014. This little film blew me away. I've been a sci-fi fan for most of my life, and at this point, few things are novel or hold my attention, including books or novel because I can think or imagine those things. But World of Tomorrow was intriguing with the several novel/unique ideas, and they way the story was told; I don't think I've even seen any plays that can introduce novelty, surprise, and sadness within seconds or simultaneously. When I find something that I like, I google it to do death, so I since it sounds like other people enjoyed the work of Don Hertzfeldt, I think other people might also enjoy his recent Reddit AMA because he briefly discusses the creation of this animated short. How much was the "world of tomorrow" shaped by random things his niece said? ... simon was the name of one of my mother's cats.... he walked by at one point and winona said, "simon!" and therefore that became the name of the monster. Hey folks, just an FYI, your local indie or small theater might be showing the 2016 Oscar Animated Shorts. So now's a good chance to watch World of Tomorrow in theaters! Having rewatched for like the Nth time in theaters, I have to say some of the nuances of the more sci-fi sound effects were easier to hear. The big screen didn't help much in visuals, but it is larger, so that's a plus. The biggest plus was sitting with an audience and watching it, and people laughing as a group when Emily would say "What?" or when 3mily says she falls love in a rock. I think the biggest laugh was when she said the robots on the moon occasionally wrote "bad poetry". For people looking for the perfect gift for themselves, Hertzfeldt ran a kickstarter last year to fund an anthology blu-ray ("the struggling independent animated short films you grew up with"), and is currently selling some extra copies at bitterfilms.com. Includes World of Tomorrow, It's Such a Beautiful Day, and more. Yeah, I should have posted an update to this thread -- a month ago I sent the email saying I was interested in a post-Kickstarter Blu-Ray when they became available, and a few weeks later I got an email with instructions on how to pay. I paid and got a disc within a week. It's pretty great -- it has HD versions of both the full 2012 It's Such a Beautiful Day trilogy and World of Tomorrow, as well as a few of his other short films. It looks beautiful, especially World of Tomorrow.